According to the Daily Mail, the brutal cold front is currently clobbering several states with many of the temperatures only reaching a high in the 20s and lows in the single digits well below the freezing point. In addition, wind chill advisories are also in effect for parts of Maine, Vermont, New Hampshire and New York. Up to one million revellers are expected to gather in New York City's Times Square on Saturday night to celebrate. Forecasters predict the temperature to be around 12 degrees in the evening, however, it will feel dramatically colder due to the wind chill. Here 3 hrs South of Sydney the temperature is plus 27 C humidity 77% but feels higher. Hoping to return ASAP, I don't rate my chances in the Northern Hemisphere. "Most of the US will be plunged into arctic conditions". How is 10 to 12 states "most of the US"? Definitely not California, where we're having one of the warmest and driest winters I've ever experienced. The Midwest "snowmageddon" and California's winter are related. 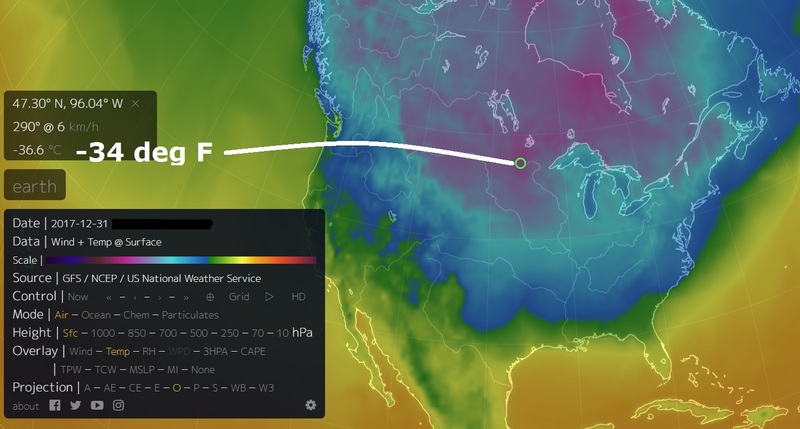 There's been a persistent high pressure system blocking Gulf of Alaska storms from going through California--instead, sending them into northern Canada, then bringing the Arctic-like temperatures into the northern U.S. Midwest and New England. Global warming ? Yeah right, looks like theres too much global freezing taking place huh ? The deformation of the jet stream and resulting persistent high pressure systems are climate change (due to anthropogenic global warming) in action. So Alaska is baking while the upper Midwest is experiencing Arctic -type weather. Weird, but true. You'll be put to death. All of you!